George Wilkerson was born on April 23, 1924, in Kearney, Missouri. He joined the Army ROTC detachment at the University of Missouri in August 1942, and enlisted in the U.S. Army Reserve while in college on December 9, 1942. 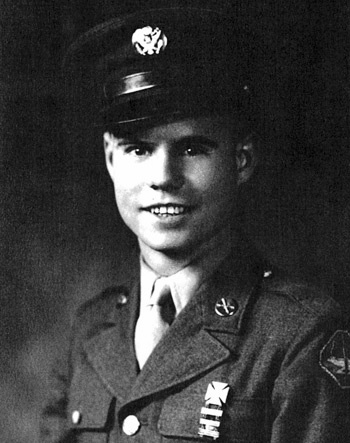 Wilkerson was called to active duty on March 27, 1943, and after basic training was sent to the University of Indiana for the Army Specialized Training Program (ASTP) to become an officer. Before his ASTP training was complete, he was deployed to Europe with Battery C, 412th Armored Field Artillery, of the 20th Armored Division, in February 1945. Sgt Wilkerson participated in combat in France, Belgium, Holland, Austria, and Germany, before returning to the U.S. in August 1945. His unit was scheduled to take part in the invasion of Japan before the war ended. Sgt Wilkerson received an honorable discharge on February 14, 1946. After completing his degree, George worked for Ford Motor Co. Tractor & Implement Division until retiring in 1986. He and his first wife, Mary Catherine Brown, were married from February 20, 1949, until her death on October 26, 1980. They had three children together-David Winn (born in 1951), Paul Allen (born in 1954), and Catherine Lois (born in 1968). George married Mary Louise Johnson Matson on March 2, 1990.